Blackboard Learn 9.1 Q4 2016 includes multiple new and enhanced features, improved work flows, and technology updates. The Learn 2016 Theme for Blackboard Learn is a modern version of the user interface that incorporates elements from the new Blackboard design language including color, fonts, and spacing for greater consistency between Blackboard Learn, Collaborate, and the Bb Student app. This optional theme is a first step in improving the experience for mobile users. Instructors and students can access their course materials whether they're at a desk or on the go! The Learn 2016 theme was designed with WCAG 2.0 principles in mind and follows accessibility guidelines for structure, color contrast, and navigation. Fully visible keyboard focus has been built directly into this theme as well as best practices for the definition of buttons and menus used for navigation. The theme will continue to be extended to incorporate modern screen reader navigation approaches such as ARIA landmarks. While the experience is improved, mobile browsers are not a supported technology at this time. Shows full title of each column, view as many columns as screen size will allow. Full screen mode introduced. 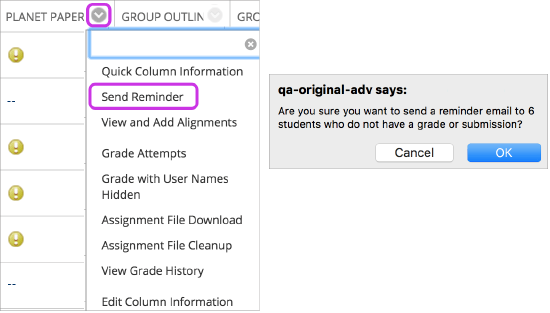 Note: Drag and drop is not yet available in every area of Blackboard Learn where users can attach files. The Dropbox Education integration allows instructors and students to easily link to and upload their Dropbox content into their Blackboard Learn courses. Students are able to upload assignments from Dropbox using any device. Instructors wanting more information about using the Dropbox Education integration should contact the Faculty Center at ittclab@astate.edu or (870) 972-2334. Note: The Upgrade Preview site has course shells for faculty and staff to use only to preview the Q2 2018 upgrade. The course shells in the Upgrade Preview site are not live Blackboard courses and should not be used to teach online courses. Grades in these courses will not transfer to Banner. The Upgrade Preview site may be down for maintenance often and without warning from the Blackboard Administrator.